Earlier in April I spent a week in southern France, where I had rented an apartment in Gruissan, a small town near Narbonne. 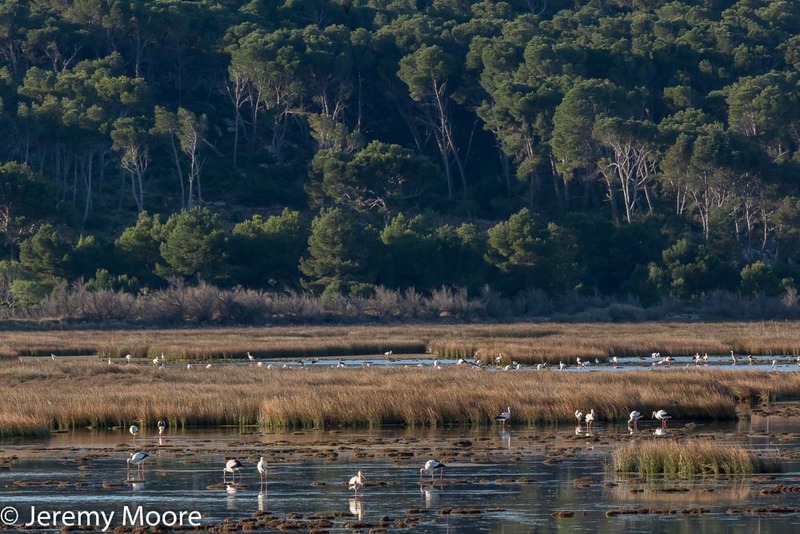 The area is sometimes known as the “Little Camargue” as it is blessed with a similar range of habitats – sandy beaches, saltpans, reedbeds, and lagoons of varying salinities, for example. It has a similar range of wildlife. It is also plagued by two other things, which are more or less mutually exclusive. Wind and mosquitoes. The Camargue has the Mistral – a strong northerly which sweeps down the Rhone valley between the Massif Central and the western Alps. Narbonne has the “Tramontane” – a north-westerly which roars across country between the Pyrenees and the Massif Central. Both have mosquitoes but either wind renders them rather less of a problem than they otherwise would be. During migration periods birds travelling north (or south) tend to hug the coast quite closely if the Tramontane is blowing, and they also move at very low altitudes. During my first couple of days, it was so strong that virtually nothing was moving at all. In Gruissan there is a small rocky knoll capped with the remains of a castle; it was almost impossible to stand upright on the summit one morning. But on the third day the Tramontane very gradually decreased allowing migration to recommence. I was blissfully unaware of this, having gone a short distance inland to search out some lesser kestrels. But in the evening I took a short coastal walk and was really excited to see a large flock of very large birds heading along the coast towards me. “Cranes”, I thought, but as they got closer and then passed overhead I could see they were white storks. It was a fabulous sight. I barely needed my long lens to photograph them, which was a shame, because that was all I had….. The next morning dawned calm and sunny. I set out in the hire-car to visit a nearby marsh. A couple of miles out of town I passed between some lagoons; to my left, in addition to groups of flamingoes, I could see other large, long-legged wading birds. White Storks! Presumably the flock that passed over me the previous evening had dropped down into the lagoon for the night, and were now busy feeding up for the next stage of their journey. The storks were pretty distant so I pulled the focal length out to 600mm for the first series of images. When photographing birds it is difficult not to use the longest focal length possible. But after a while I began to notice the pine woodland on the far hillside and how much it could add to an image of the birds and the wetland. The lower image is taken at 400 mm, and to get as much depth of field as possible, f16. 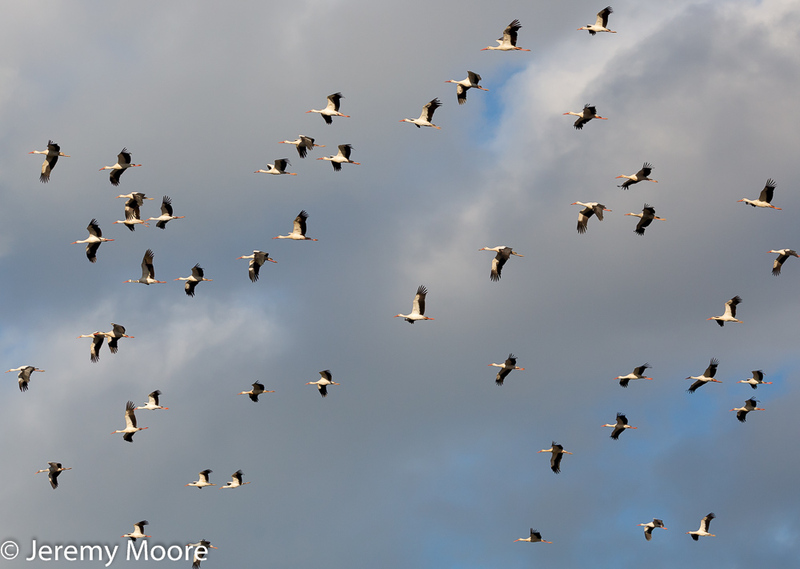 The storks were not moving too quickly, so 1/320th second was acceptable. So would I go back to Narbonne for another birding and photography trip? Definitely. In early/mid April there was surprisingly little bird-song in the reedbeds, scrub, woodland or nearby farmland. But I feel sure that by now all those habitats would be heaving with warblers and other desirable species. The area is more scenic by a long way than the Camargue, with many areas having a hilly or even mountainous backdrop. The biggest advantage, though, was the accessibility of so many of the habitats; there are far fewer access restrictions than in the Camargue. And it is a relatively compact area, so driving distances are shorter. If anyone would like more information about the area, drop me a line. I’d be happy to advise. Love these images Jerry, it must have been a sight to see so many in the air. Nice shooting, Jerry, The 400mm @ f16 works well, good thinking! Any news on dotterel this year? I went up one of the well-known Carmarthenshire hills for them about ten days ago but had no success. But it is a very large flat summit and the chances of finding them would have been pretty low. Hi Jerry, 5 birds were reported on Pendle on the 21st of April. By the time I made it a couple of days later they’d already moved on. The wind direction since then hasn’t helped but it looks more promising around the middle of this week. If I see or hear anything I’ll let you know.